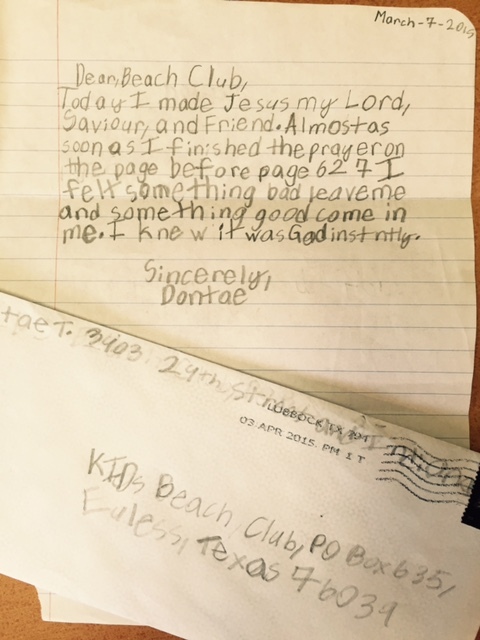 Johnny and Dontae are two boys in Beach Club who recently shared how they put their trust in Jesus Christ as their savior after exploring their new KiDs Beach Club® Bible. 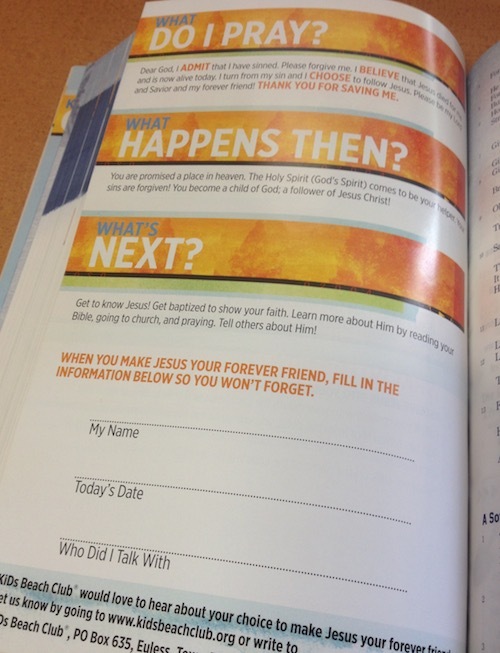 A few weeks ago Johnny approached his club leader with his Bible in hand and open to the plan of salvation page. He pointed to the page and began to tell his leader that he had prayed the prayer of salvation and showed where he had filled in his name and the date. Then he pointed to the last line that says “Who Did I Talk With” and said he needed to get that part done. While talking with his leader Johnny explained that he was sitting in his room reading his new Bible and found this page. After talking a bit more and making sure he didn’t have any other questions, his leader gladly signed his page and prayed a prayer of thanks to God for the free gift of salvation. Johnny is a third grader in the Dallas/Fort Worth area. Today I made Jesus my Lord, Saviour, and Friend. Almost as soon as I finished the prayer on the page before page 627 I felt something bad leave me and something good come in me. I knew it was God instantly. If you are a KBC volunteer, financial supporter, prayer warrior, or a combination of any of those, know that your efforts don't go unnoticed and you are making a difference for the Kingdom!